Making her way through the small lakes and rivers of Ireland, the Shannon Princess is owned and operated by the accomplished and accommodating Irish husband and wife team of Chef Olivia Power and Captain Ruairi Gibbons. Their passion, dedication, and commitment to the Shannon Princess is evident from the moment guests board. 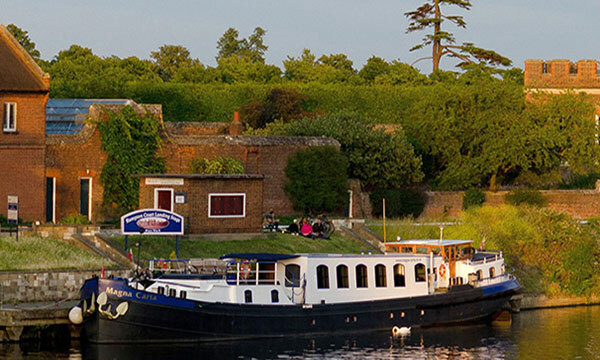 Captain Ruiari functions as a trusted guide to the area’s many attractions, while Chef Olivia is among the best Chefs in barging, having taken her culinary training at Ireland’s prestigious Ballymaloe School of Cookery. Together, they successfully mixed contemporary luxury with a welcoming atmosphere, creating Ireland’s most magical of floating homes. Delightfully decorated in rich browns and soft creams, the vessel’s salon and dining area serves as the social center of the cruise. Ample seating, portrait windows, and décor featuring locally made artwork ensures the perfect spot for guests to gather. The river’s scenery and greenery is best viewed from the expansive deck, or perhaps while lazing in the hot tub with a fresh cup of coffee and Baileys! Cabins are cozy and comfortable, offering clever storage space and beautifully tiled bathrooms. A surprising highlight for gourmands and gastronomes, Chef Olivia’s exquisite “New Irish” cuisine is uniformly praised for her creative use of traditionally Irish ingredients in her deliciously modern menus, which focus on artisan products and locally-sourced produce. Excursions reveal Ireland’s cultural treasures both ancient and current; the boat’s sightseeing opportunities includes a whiskey tasting, a private musical performance, and lunch ashore at an authentic Guinness & Oyster Bar! Crew aboard the Shannon Princess are carefully chosen by Ruiari and Olivia; accordingly, guests can expect attentive service, friendly personalities, and warm hospitality. Enjoy our blog post featuring a special dessert recipe from Chef Olivia! A Barge Cruise Fit for Royalty – the Shannon Princess! In the afternoon, you will be met by a crew member of the Shannon Princess at the designated meeting point. From here, relax as you are chauffeured to the barge, moored in the delightful town of Killaloe. A traditional champagne welcome and introduction to the crew awaits you, before your first gourmet dinner onboard. This morning, the Shannon Princess slips onto the river and literally goes with the flow, up through Lough Derg with its many islands and Medieval strongholds. This afternoon, your Tour Guide escorts you to Adare Manor for an interactive experience with their falcons and other birdlife. "Walk the birds" as they are released to follow you through the grounds! Return to the barge for cocktails and canapes. Expect lively conversation at dinner onboard. Today Shannon Princess meanders effortlessly north through Lough Derg. Laze on deck, lounge in the hot tub, or Join Captain Ruairi in his wheelhouse. Join the locals for lunch at Derg Inn before a visiting Leap Castle, rumored to the Ireland’s most haunted house! It's a unique experience to be welcomed by owner Sean Ryan and his family. Back at the mooring, take time to explore this hamlet - walk, cycle, or make a wish in one of the village wells. Then enjoy another gourmet dinner onboard. This morning, your first visit is to Portumna Castle. Experience the Abbey and the 17th century kitchen garden, from where your Chef purchases fresh produce! 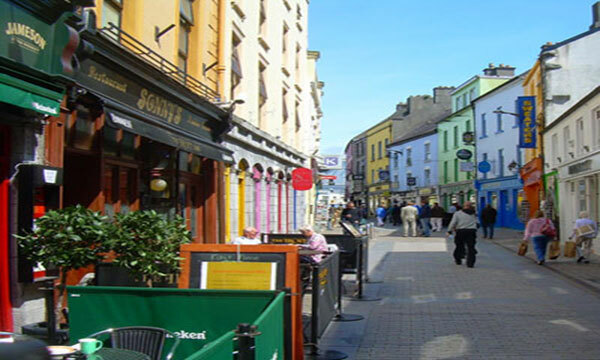 Then it's on to Galway City, a lively university town and cultural center. Lunch is at an authentic Guinness and Oyster Bar in Eyre Square, followed by time to browse in the local craft shops. Return to Shannon Princess for a lazy afternoon cruise, and enjoy a gourmet dinner onboard. The Shannon Princess glides along the river on a morning cruise through the Irish countryside. Relax on deck with a cup of coffee and enjoy the greenery and scenery. En route, moor at Clonmacniose, an ancient and atmospheric Monastic site founded in the 6th century. After a guided tour, the cruise continues to Athlone. Overnight in this bustling town with time to visit charming craft and antique shops, or sing with the locals at a traditional music pub. Dinner is served onboard. This morning's final cruise is the perfect time to laze in the hot tub, or visit Captain Ruiari in his wheelhouse. Relax as you float along the River Shannon's beautiful "Inner lakes". This afternoon, your Tour Guide accompanies you to Kilbeggan Distillery, where the secrets of Irish Whiskey making are revealed. Established in 1757, it is now the world's oldest licensed whiskey distillery. Return to Shannon Princess for a Farewell "Slainte" gourmet dinner. In the afternoon, you will be met by a crew member of the Shannon Princess at the designated meeting point. From here, relax as you are chauffeured to the barge, moored in the delightful town of Glasson. First up is a champagne – or soda! -- reception, then relax until your first family dinner. The adventure begins with a morning cruise, mooring at Baysports Boat Training and Watersports Centre. Activities such as offering Zorbing, Water Trampoline, Kayaking, Currach Rowing, Dingy Sailing, and Power Boating are all on offer, and participants of all ages are invited to join the fun. In the evening, after a brief cruise, enjoy a visit to a pub which claims to Ireland’s oldest, and then another family feast is served onboard. A morning cruise lets the Shannon Princesss moor right at Clonmacnoise, the ruins of an ancient monastery. Explore this great center of religion and learning. Alternatively, a Tour Guide can lead your group on a bicycling adventure. Chef Olivia will provide a picnic lunch! Rejoin the barge at her overnight mooring in Shannonbridge. For the non-cyclists, there is a choice of ghost hunting at Leap Castle, or a visit to an award-winning organic farm. After a festive dinner onboard, the whole family can enjoy live music at Kileen’s Pub. This morning's cruise allows for time to explore this charming village. In the afternoon, your Tour Guide escorts you to Oliver Walsh’s spectacular “Flower Hill Country House Equestrian Centre” for some of the best horse riding Ireland has to offer. This is a chance to experience a natural Cross Country Course within the infamous Galway Blazer Fox Hunt Stone Walls. Return to the Shannon Princess, and why not step into Chef Olivia’s kitchen for a fun bread-making lesson? Another family dinner is served onboard. Start with an early morning cruise followed by a visit to the magnificent Cliffs of Moher. This is top of the list of places to see in Ireland and a designated UNESCO Geo Park. The Cliffs range for 8 kilometers over the Atlantic Ocean on the western seaboard of County Clare. There are plenty of natural wonders to enjoy here. Your Tour Guide returns your family to the barge, providing the perfect opportunity for a splash in the hot tub. Chef Olivia serves another festive dinner onboard. Did You Know Boats Could Fly?! This morning's cruise sails through lakeside scenery. Relax on deck and admire the greenery and scenery. This afternoon, your Tour Guide escorts your family to the Foynes Flying Boat Museum, which captures perfectly the romantic era of the first TransAtlantic passenger flights made by what were known then as “flying boats.” Return to the barge, and relax on deck, take a dip in the hot tub, or explore the area with a bicycle ride. Tonight's dinner is very special as Captain Ruairi joins your family as the guest of honor at the Captain's Dinner. Please note: We welcome families with children and most activities are inclusive while some, e.g. ballooning, go-karting and horseback riding are at additional expense, payable to the provider. Let us know your interests in advance. This is a sample itinerary which may be subject to change depending on local conditions. After a delightful morning cruise, transfer to Lahinch Golf Club, one of the top courses in the world, for lunch in the clubhouse and an 18 hole round. Golf at Lahinch dates back to 1892, making it one of Ireland's oldest clubs. The unpredictable winds coming off the ocean add an interesting twist to your game. Non-golfers will be taken to lunch and then to the Burren Perfumery. Experience how perfume is created from garden to bottle, followed by a delicious High Tea in a local inn. All return together to Shannon Princess for cocktails and dinner. After a sunrise cruise to Dromineer, the golfers will play at Adare Manor Golf Resort, an exquisite 18 hole Championship Course which features 230 acres of lush Irish countryside. Adare was designed by the legendary Robert Trent Jones, Senior. Lunch will be taken at the course. Non-golfers will shop for antiques and gifts, followed by lunch in the charming village of Adare. All guests will return to Shannon Princess, still moored at Dromineer, for a gourmet dinner and evening sail. After breakfast, your Tour Guide escorts you on a to visit Mossfield Organic Farm for a sample their award winning cheeses, and then its to neighboring Leap Castle. Reputed to be Ireland’s most haunted house, Leap Castle was once home to one of America’s founding Fathers, John Carroll. You will be hosted by Sean Ryan, a renowned musician and his family who will invites us in to their unusual home. Return to the barge and laze in the hot tub or explore the riverside path by bicycle or on foot. After dinner onboard, find music and banter ashore at local pubs. Cruise this morning through the protected Callows, a wild life flora and fauna reserve, mooring at Clonmacnoise, the ruins of an ancient monastery. After a guided tour, depart for 18 holes at the K Club. Host for the 2006 Ryder Cup, this Arnold Palmer designed course is one of the premier parkland golf courses in Europe. Non-golfers can elect to visit a top horse breeding farm, or shop at Kildare village with its many designer outlet stores. Return to barge for another gourmet dinner. Share golf lore and music at a waterside pub. Cruise this morning through the Shannon’s beautiful Lough Ree and the Inner Lakes passing the route's stately riverside homes. 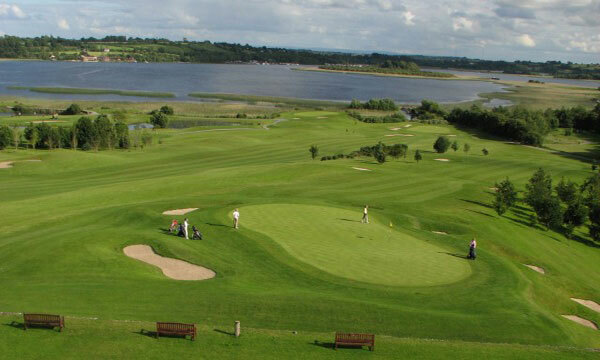 Glasson is one of the most scenic courses in Ireland, with panoramic views over Lough Ree from every hole. The non-golfers will enjoy a cooking class in Chef Olivia’s kitchen. Everyone will have lunch on board, followed by an afternoon tasting at the Old Kilbeggan Distillery, a local distillery dating from 1757. Also visit the nearby Ballinahown Artisan Craft Village. A multi-course Captain's Dinner ends your cruise in style! Please note: Our golf itinerary requires a minimum of 4-golfers per charter and includes four pre-booked courses, pre-booked tee times, and transfers to and from the golf clubs. Supplement fee per person is $900 and only golfers pay the supplement. Not included but available are club rentals, a caddy, buggy or push trolley, please let us know your needs in advance. This is a sample itinerary which may be subject to change depending on local conditions.